Clever advertising – or brilliant strategy? A last word on this cleverness business. One way to get really, really clever (and effective) with your advertising is to be clever with your strategy. In the days when not many people had cars, Michelin had a problem. Not enough people were buying their tyres. So did they run ads extolling the virtues of their product against Dunlop and the rest? Nope. They came up with the idea of Michelin Guides. These contained everything you need for the perfect motoring holiday, including those out of the way gastronomic gems which were ‘vaut le détour’. And by making all these trips and taking all those detours, you were also burning up more tyre rubber. 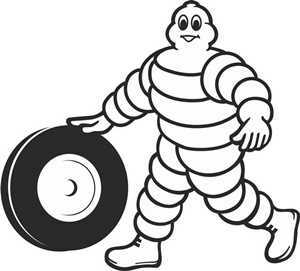 Result – many more tyre sales, and Michelin never looked back. Back in the 1960s a flour company wanted to sell more flour. Did they simply create ads cleverly positioning their product as superior to the competition? No. They came up with the idea of ready-bake cakes, some recipes to go with them, and a new brand name. Forty years later, Mr Kipling is still doing exceedingly well. How about advertising for a product no-one could buy? During the Second World War chocolate was strictly rationed and most brands were simply not made for the duration. Not much point in advertising, you might have thought. Most confectionery firms would have agreed with you – they didn’t bother to advertise during the war. But one firm did. And when chocolate became widely available again, what did the public crave and overwhelmingly opt for? Those brand names that had been at the forefront of their minds thanks to all the advertising during those lean years. And why waste precious budget on ads that will never appeal to most readers? A few years ago, Snapple brought out a kiwi fruit flavoured drink. Problem is, a lot of people can’t stand kiwi fruits. So instead of running ads about their new drink, Snapple saved themselves a small fortune by printing up a load of stickers and putting them on kiwi fruits in supermarkets. The stickers simply pointed out in that Snapple was now available in kiwi fruit flavour. There was nothing clever about the line they used – but the strategy was brilliant. So next time you’re thinking of running a clever ad or campaign, it might be a bright idea to check your strategy first. This entry was posted in Advertising copywriting and tagged clever advertising, clever strategy. Bookmark the permalink.